We’ve been battling poor internet connections for the past week, hence the delay in these posts. 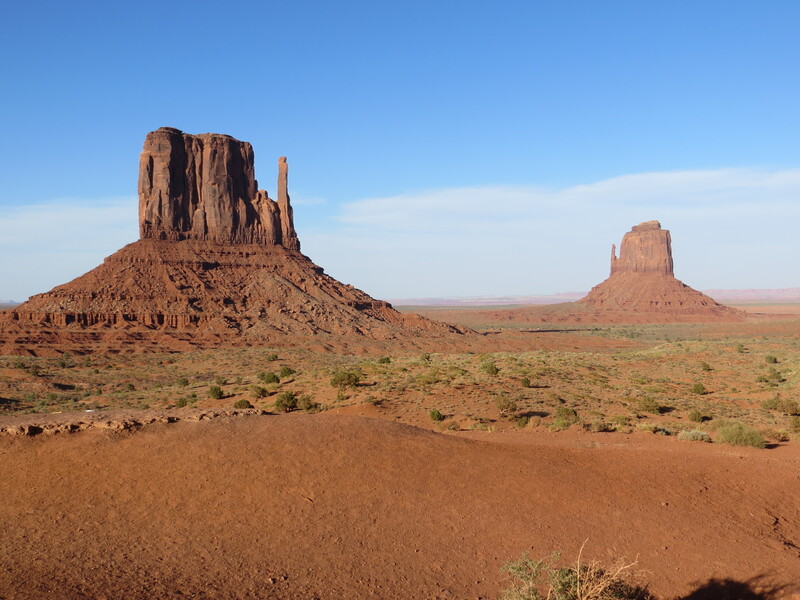 After our windy night at Gooseneck State Park we headed to Goulding RV Park in Monument Valley where, guess what, it was still windy. The monuments were obscured by clouds of dust. We learned that there was an approaching front, but that the wind was supposed to die down by the next day. opening for the fire and a doorway that always faces east. The exterior is composed of the bark that had been previously removed from the logs. This bark is laid over the logs and then dirt applied over the entire structure. This keeps the building cool in the summer and warm in the winter. Inside the Hogan a woman was demonstrating traditional weaving techniques, using wool from the sheep that they raise. 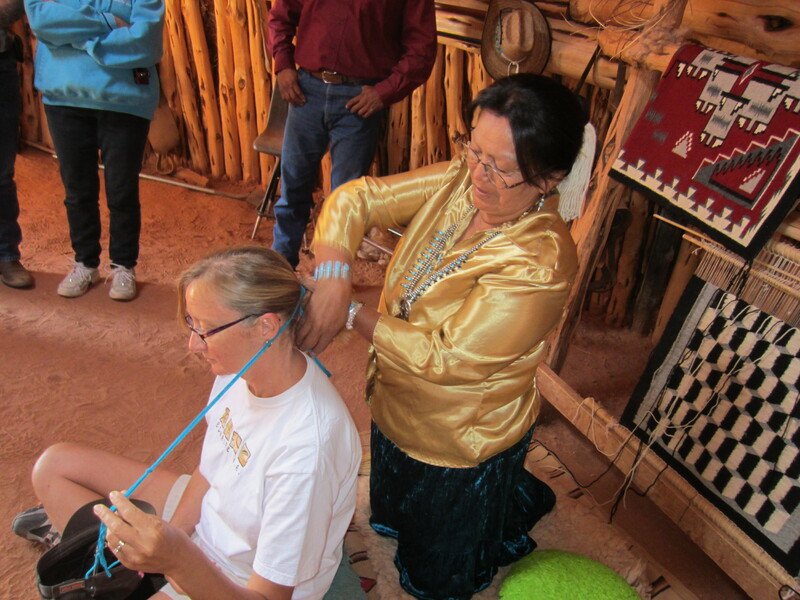 She also wanted to demonstrate a traditional Navajo maiden hair style and since I had the longest hair of all the women there, I was chosen to demonstrate on. She brushed my hair with a broom-like brush and then started weaving a long piece of wool through it. It was beautiful and wonderfully cool and stayed tightly in place all day, even when the wind started to pick back up. That evening just before sunset, we went back out and drove the 17 mile loop ourselves, where we were lucky enough to see a full moon rising over the monuments. We went to the same Hogan. 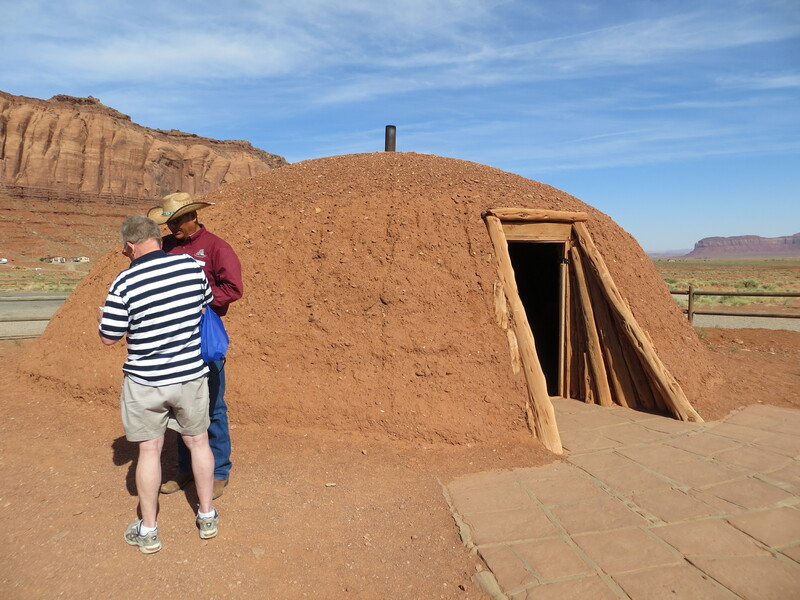 Suzie Yazzie was there. She is about 200 years old! He did mention a weaver who had just died this past winter. Must have been her. 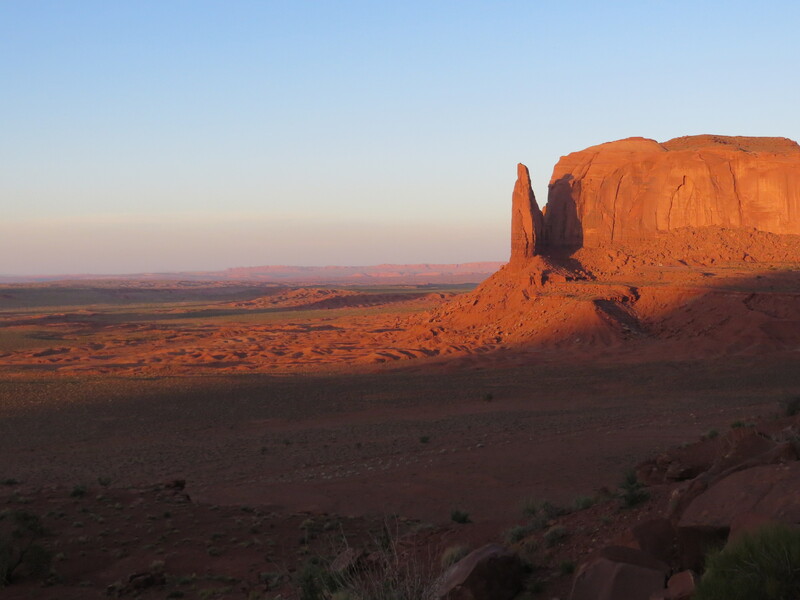 Where, in such desolation, would the Navajo find logs to build a tradional hogan? 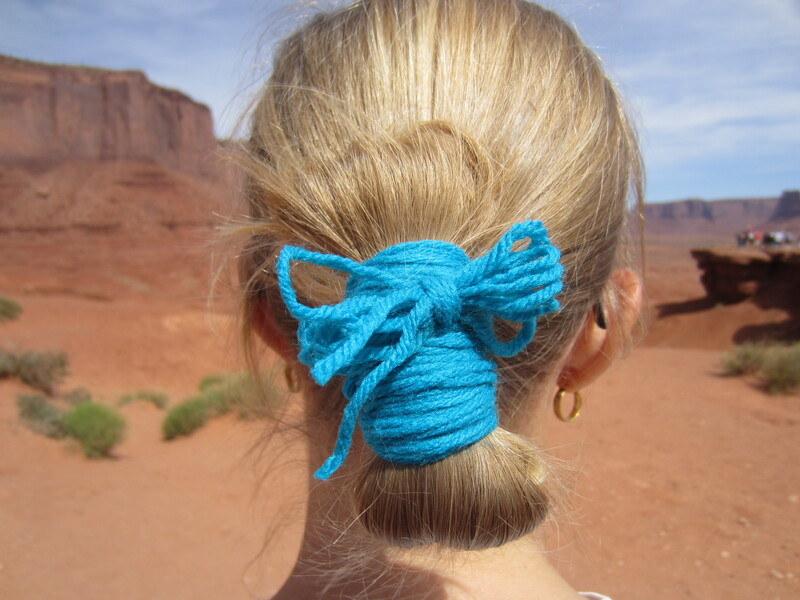 On another domestic front, did Leonard learn how to weave the Navajo bun? 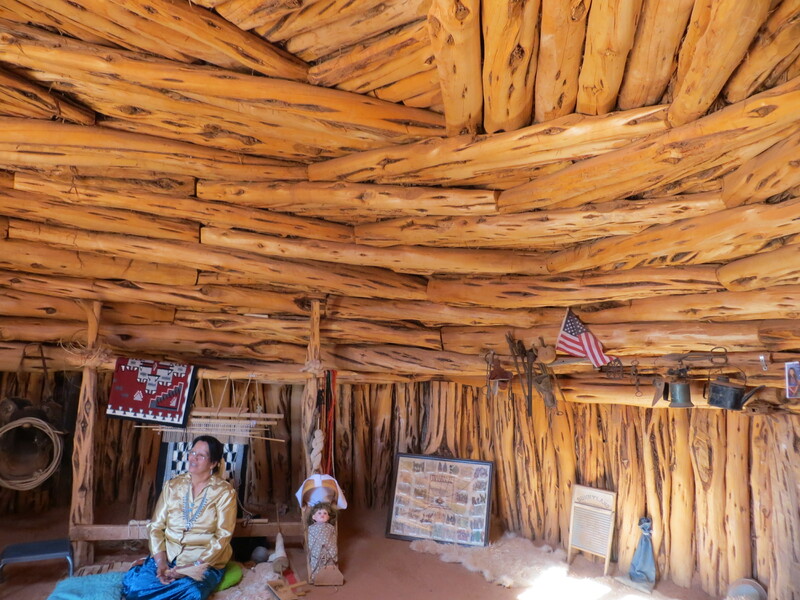 Apparently there used to be logs closer by but they’re all gone and now they have to go 100 miles away to get the logs and no unfortunately Leonard did not pick up the art of Navajo hair weaving. Too bad. We slept in this Hogan. It was a bitterly cold night and we were very unprepared with only one sleeping bag but although we were cold (even with a roaring fire) we wouldnt have missed the opportunity. We arose very early and watched the sunrise and the car was covered in ice and said it was 17 degrees farenheit!! What a wonderful experience, you’re very fortunate. It must have been amazing to sit in there with a huge crackling fire and see the light dancing off the beautiful woodwork.